Charles M. Schulz (1922–2000) believed that the key to cartooning was to take out the extraneous details and leave in only what's necessary. For 50 years, from October 2, 1950, to February 13, 2000, Schulz wrote and illustrated Peanuts, the single most popular and influential comic strip in the world. In all, 17,897 strips were published, making it "arguably the longest story ever told by one human being," according to Robert Thompson, professor of popular culture at Syracuse University. 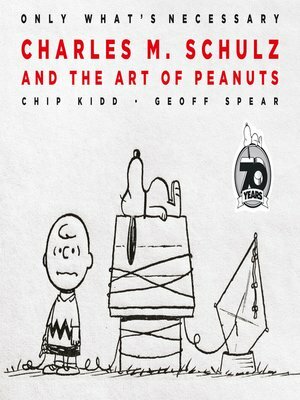 For Only What's Necessary: Charles M. Schulz and the Art of Peanuts, renowned designer Chip Kidd was granted unprecedented access to the extraordinary archives of the Charles M. Schulz Museum and Research Center in Santa Rosa, California. Reproducing the best of the Peanuts newspaper strip,all shot from the original art by award-winning photographer Geoff Spear, Only What's Necessary also features exclusive, rare, and unpublished original art and developmental work—much of which has never been seen before.